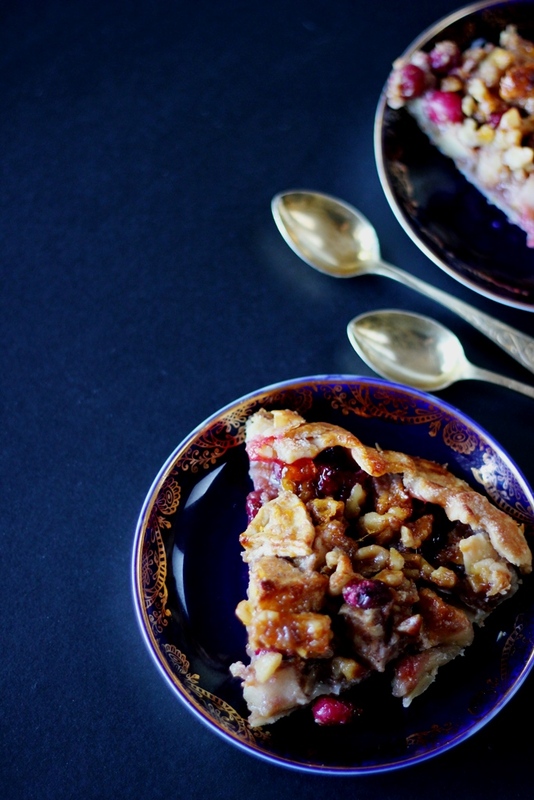 With the Thanksgiving on my mind and a friend’s visit, I wanted to bake a seasonal dessert. 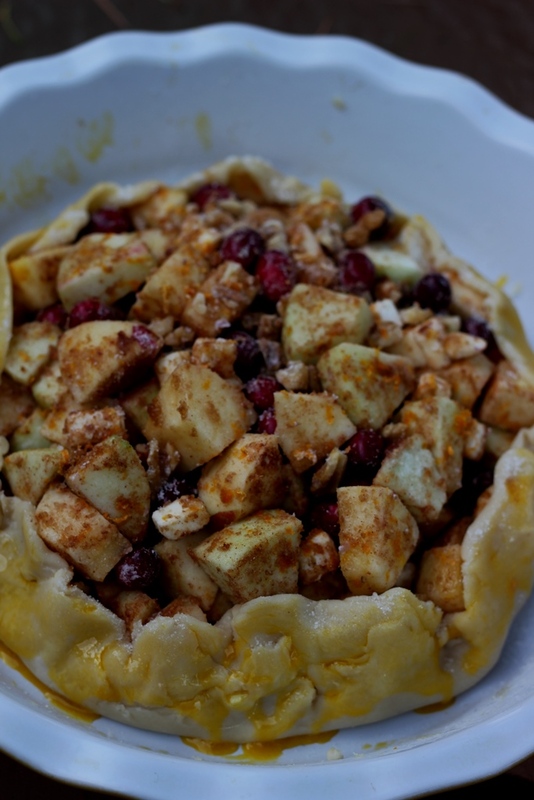 Surrounded by fresh local apples and cranberries, I decided on a simple and elegant Apple Cranberry Walnut Tart. 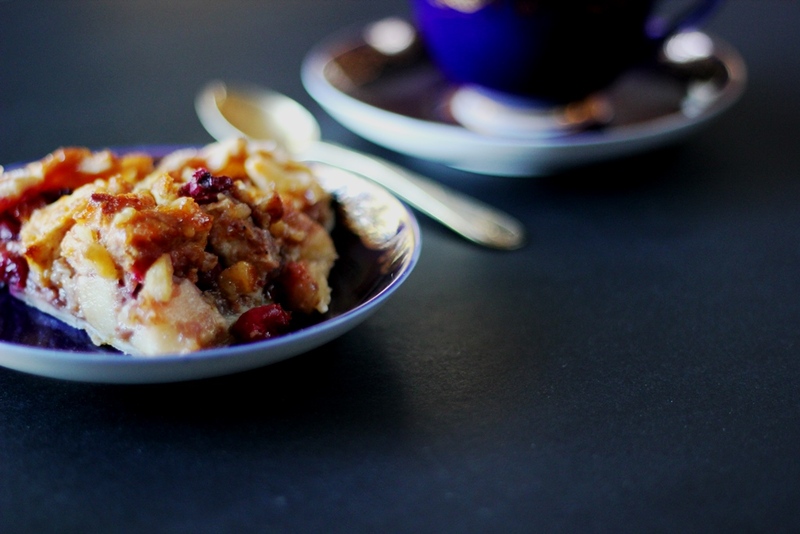 This one could easily be adapted for pecans, if you are in the mood for a more traditional Thanksgiving combination. I used a store- purchased pie crust, but please go ahead and use a homemade if you have time and desire. With apples, I’d recommend using a crisp variety. I chose a combination of Granny Smith and Honey Crisp. If time is an issue, you can cook the filling slightly before baking the tart ~ this will significantly reduce the time it needs in the oven. 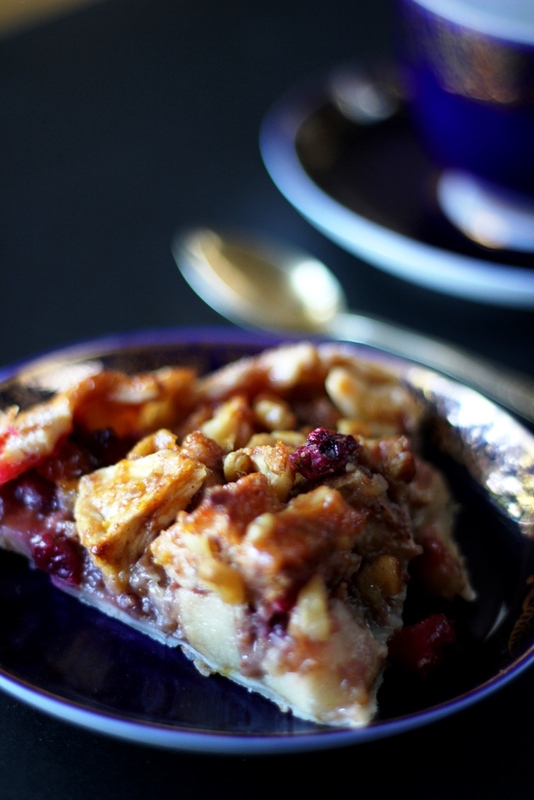 While a scoop of vanilla ice cream is always a welcome accompaniment, we enjoyed the tart on its own. 1. Preheat oven to 400 degrees F and grease a baking pan with 1 tablespoon of butter. 2. 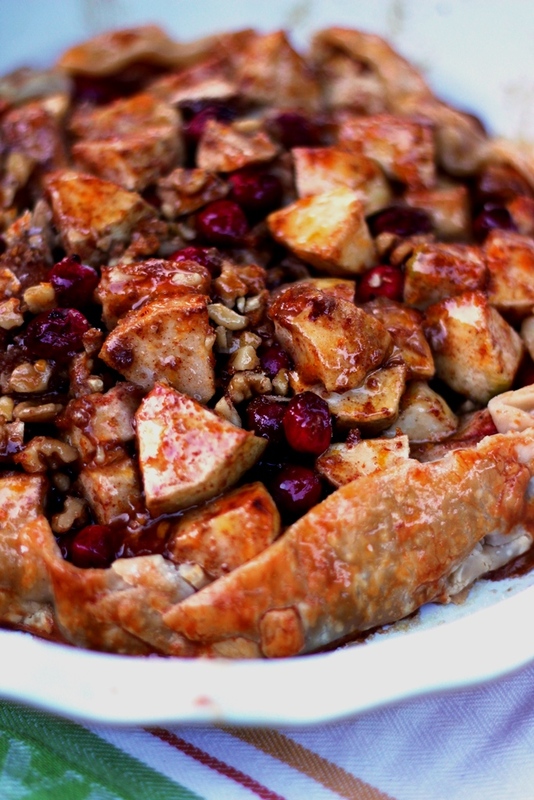 Roll out the crust on the bottom of the baking dish and brush with tablespoons of apricot jam. 3. 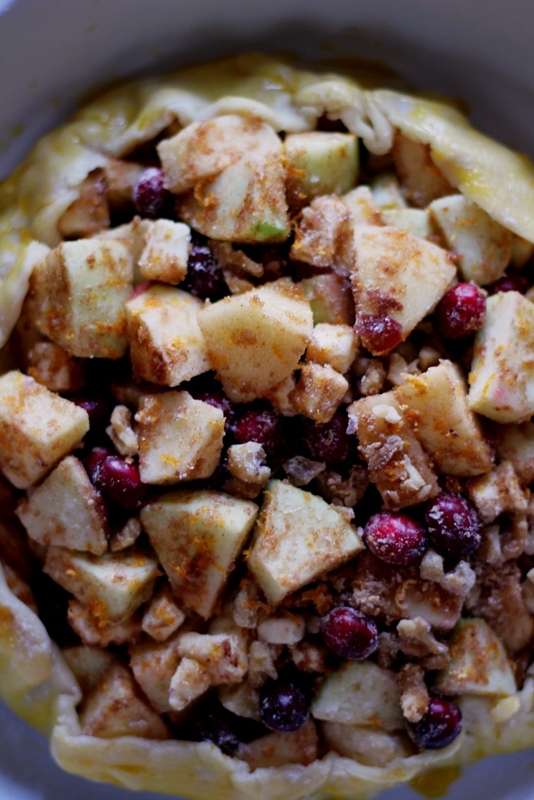 Toss together apples, cranberries, walnuts, flour, sugar, cinnamon and zest and pile in the center of the crust. 4. Dice the remaining 2 tablespoons of butter and dot over the filling. 5. Crimp the edges of the crust over the filling lightly and brush with 1 beaten egg yolk. 6. Bake in the preheated oven for 15 minutes, then lower the heat to 375 degrees F and bake for another 30 minutes. 7. Heat the remaining apricot jam in the microwave for 30 seconds and brush over the tart. Return to the oven and bake for another 15-20 minutes. And the tart is ready! Do give it about 30 minutes to cool and set up before slicing.